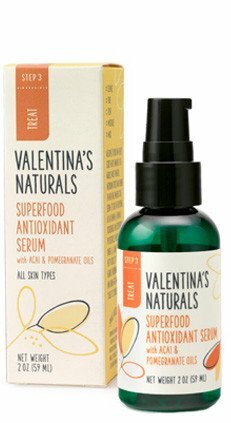 This Superfood Antioxidant Serum is packed with Argan Oil, Vitamin E and essential fatty acids. It seals in moisture and protects your skin from free radicals. Pomegranate Oil is the plant world's riches source of Punicic Acid. Punicic Acid is a polyunsaturated fatty acid that studies show helps stimulate "keratinocytes", which are the major cells found in the outer layer of the skin. Helping to regenerate these cells may actually help reverse past damage to revive skin and reveal a newer and more youthful appearance. Acai Berries boast the highest per unit value of antioxidant power (ORAC) of any edible fruit in the world. Their oil is rich in Omega 3, Omega 6, and Omega 9. They also contains vitamins such as B1, B2, B3, E, and C, minerals such as Phosphorus, Calcium, and Potassium, as well as polyphenols, anthocyanins, and phytosterols. This oil is a true superfood for your face. After cleansing and toning, use a few drops on skin at night before sleep or follow by day with the moisture oil or sunscreen of your choice. This is small batch skin care. Made in very small batches so that only the best is what you get. Valentina's Naturals are available online at www.valentinasnaturals.com. They make skin care, facial care, hair care, and body care.